A stage show I helped write last October has been nominated for a Rondo Hatton Award as the Best Fan Event of 2012. 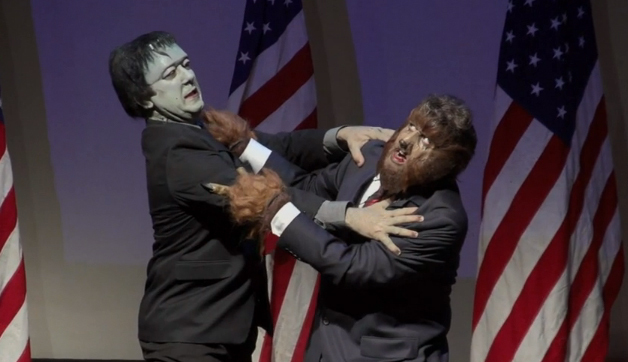 Our show was Frankenstein Meets The Wolf Man: The Presidential Debate, a live satiric standoff between the two infamous Universal Monsters that was staged before screenings of the classic film by the same name. Introduced by Bela Lugosi Jr. and Ron Chaney, this political parody pitted flat-headed flat tax proponent Frankenstein against the lunar energy advocate Wolf Man. The show starred Daniel Roebuck (THE FUGITIVE, LOST and aka horror host Doctor Shocker) as the Wolf Man and Perry Shields as the creature. Jump the link to watch the complete show at DocShocker.com and if you care to cast a Rondo Award ballot for us while you’re there, that would be swell too. Our show is nominated in category 21 – Best Fan Event of 2012 and voting info is at the top of the webpage. My fellow Monster Americans, enjoy!